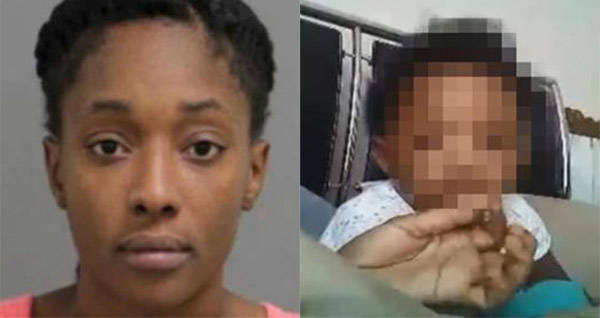 The mother was arrested after the video showed her one-year-old child smoking a cigarillo. A North Carolina woman has been arrested after footage surfaced of her child smoking marijuana. In the 10-second clip, 20-year-old Brianna Lofton, of Raleigh, can be seen holding a cigarillo up to the one-year-old child’s lips. After a moment, the child appears to inhale and then lets out a puff of smoke. Lofton was arrested on Wednesday, said the Raliegh Police Department, and the child is safe. Lofton has been charged with marijuana possession, contributing to delinquency, and two counts of felony child abuse. Though it is not clear from the video what the child was smoking, the arrest warrant claims it was marijuana. Police were first alerted to the video on Wednesday morning after multiple Facebook users reported it. One Facebook user, in particular, was praised by police, after reposting the video which then got over 1 million views. Rasheed Martin said he didn’t know the mother or the child but first saw the clip when a friend shared it online. Martin then reposted the video in the hopes that one of his friends could help identify the woman. After Lofton was arrested, the child was placed in the custody of the Wake County Child Protective Services. Next, read about the zoo that can’t get people to stop giving their orangutang cigarettes. Then, read about more bad parents, like this woman who grilled her daughter.